Are you ready for week two of the Summer Sweat Series 2016? Last week was amazing — from the workouts to the meal plans, your participation has been INSANE and so appreciated by both Lee and I. We LOVE seeing your photos in our Facebook group and on Instagram (use the hashtag #SummerSweatSeries). If you followed the Sweat Series last year, you can see that the format is still very similar. Both workouts, meal plans & grocery lists will be posted every Sunday on both my site and Lee’s. In between we’ll share more fun content such as BONUS workouts and giveaways from our amazing sponsors Finish Line and adidas. 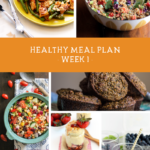 Before we get into week 1 workouts, let’s chat about the meal plan! What you need to know: The meal plan is designed for TWO people. Most of the meals are both vegetarian and gluten free friendly or easily adaptable. We believe in wholesome, nutritious, unprocessed ingredients. It isn’t all about the calories. It’s about eating REAL food. ALSO how are you loving the desserts? Life is all about balance, right? Can’t wait to do these workouts while traveling this week! Facebook Group: Don’t forget to join the SSS Facebook group for early access to meal plans/grocery lists, special offers/giveaways, and support! Wellness Wednesday: The 10 Minute Fat-Burning Workout + Summer SWEAT Series Finish Line Giveaway! 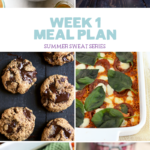 Summer SWEAT Series: Meal Plan + Fitness Details! 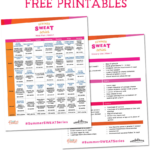 5 Responses to "Summer Sweat Series 2016: Week 2 Fitness Plan"
This is a great workout plan! Plus eating healthy like low carbs and sugar foods you’ll be a head turner on the beach!